Read reviews: About.com, Hearing Loss: The Journal of Self Help for Hard of Hearing People, Journal of Deaf Studies and Deaf Education. There are plenty of books available to teach us about deaf schools, sign language, hearing aids, cochlear implants, hearing ear dogs, and mainstreamed programs from clinical, manufacturing, and legal perspectives. Alone in the Mainstream is a fresh, comprehensive book about mainstreamed education. Fresh because Gina Oliva personalizes her own story; and comprehensive because she mixes in the viewpoints of others who themselves were products of mainstreamed education in basic human terms that all of us can understand. This brand-new book from Gallaudet University Press describes an important study about solitary mainstream students years after they have graduated and moved on in their lives. The Solitary Mainstreamed Project was directed by Dr. Gina Oliva who was mainstreamed in the public schools in the mid 1950s and 1960s. Throughout the book, Oliva shares some personal stories of these good and bad experiences. 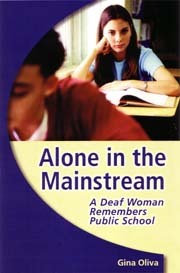 But, the story is not just about her; Oliva surveyed hard of hearing and deaf adults who attended public schools in a mainstream setting and asked them about their experiences and what they remembered. Reading poignant stories of these adults’ recollections being the only person they knew in the school who had a hearing loss is remarkable, therapeutic, and humbling. Oliva lets the adults tell their stories at length so readers are able to get more than just a taste of mainstreamed education from the perspective of affected students. She lets them talk about how their parents influenced the educational process. She lets the students talk about the social isolation. Oliva systematically voices the positive outcomes of mainstreamed education, as pointed out by the adults who were mainstreamed as children. As a researcher myself, I think Oliva brings an important question to the forefront concerning education options and consequences. Most of the students in the Solitary Mainstreamed Project admitted they had an excellent education and were thankful for their education — yet, many said the higher quality of education came at a cost: lack of socialization. Oliva points out that many mainstreamed students were not further educated about their losses, and in fact, many tried to conceal their losses so others would not know they were different. Mainstreamed programs around the country continue to flourish today. Teachers, audiologists, speech pathologists, and educators in the mainstreamed classrooms would benefit by reading this book of collected memories to determine if they can intervene and make the mainstream experience a less isolating experience and one with more direct opportunities of socialization added. As adults, we tend to share our memories with our significant others and if we have spouses, family members, friends, coworkers, and colleagues who were not mainstreamed, they do not know how the educational experience impacted on us ... until now. Urge them to read Oliva’s book to get an idea of how the isolation from peers and support from parents impacted on their education; and how their own self-esteem and life’s goals were influenced by the choice of mainstreaming. I highly recommend you read it yourself and see if you can find your own story there. Gina A. Oliva is a former professor in the Department of Physical Education and Recreation at Gallaudet University in Washington, DC.